Coverage: Live video stream on the BBC website, BBC iPlayer and the BBC Sport app, with coverage and updates also on BBC RW and BBC RC; repeated on the Red Button 9 Dec, 17:30-19:30 GMT. 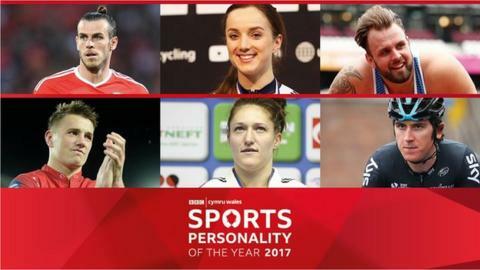 Six contenders have made the BBC Wales Sports Personality of the Year 2017 award shortlist. They are: Footballer Gareth Bale, cyclist Elinor Barker, Para athlete Aled Sion Davies, rugby union player Jonathan Davies, judoka Natalie Powell and cyclist Geraint Thomas. Former Great Britain athlete and Wales rugby union wing Nigel Walker is chair of the judging panel. The winner will be revealed during a live awards show at the Celtic Manor Resort, Newport, on Monday 4 December 2017. The nominations processes, criteria and voting details (where applicable) for each award are outlined below. This award goes to the sportsperson whose actions have most captured the public's imagination during 2017. An expert panel (hereafter 'the Panel') will be convened in November 2017 in Cardiff to decide the shortlist of sportspeople for the BBC Cymru Wales Sports Personality of the Year award. The BBC Wales Sports Personality of the Year production team will provide the Panel with an extensive list of the top sportspeople from 2017, including information on their achievements. The Panel will be free to consider other potential candidates. • Undertake a back-up vote for the main award (in the unlikely event of voting difficulties on the night of the show). • Takes into account 'impact' over and beyond the sport or sporting achievement in question. Sports people are eligible to win the main BBC Wales Sports Personality of the Year award if they represent or are eligible to represent Wales at international sport. The Panel will endeavour to produce a shortlist based on reaching a consensus view. If a consensus view cannot be reached on all or some of the candidates, then the Panel will be asked to vote for the remaining candidates. In the event of a tied vote, the chairperson's decision (Nigel Walker) will be binding. The shortlist of contenders will be announced during BBC Wales Today on BBC One Wales later in November and will also appear on the BBC Wales Sports Personality of the Year website. • A tie in the public vote amongst the two contenders obtaining the highest number of votes, the award will be shared amongst those two. There will be no award in second place category and the third place category award will go to the contender scoring highest after the two in the tie. • A tie in the public vote amongst the three contenders obtaining the highest number of votes, the award will be shared amongst the three and there will be no awards in second and third place categories. • A tie in the public vote amongst two contenders obtaining the second highest number of votes, the second place award will be shared amongst those two and there will be no award in third place category. • A tie in the public vote amongst two contenders obtaining the third highest number of votes, the third place award will be shared amongst those two. 1. Voting for the main award will be from a shortlist of contenders presented between 0800 Monday 27 November 2017 and 1800 on Saturday 2 December 2017. Voting will be available by phone or online. The number to call for each contender will be revealed when the voting period commences. The telephone numbers will be available via the BBC Wales website and social media sites. The online vote will be available via the BBC Wales website. Those who wish to vote online will need to sign in to a BBC account at https://account.bbc.com/signin. If you do not have a BBC account, you can register for one for free at https://account.bbc.com/register. If you have any trouble registering or signing in, you can visit the help pages at https://account.bbc.com/signin/help. The online vote will be open during the same period as the telephone lines. Please check your broadband or mobile contract to check the cost of using data services. 2. Voting is by telephone and online only. Please note that you cannot vote by email, Red Button or via this website. Votes will be capped at 3 votes per CLI by telephone and 1 vote per account on online. The results of the telephone vote and the online vote will be aggregated prior to any announcements. Please note that you cannot vote by email, Red Button or text. 3. Telephone and online votes will open and close as specified above. Votes received outside the specified times or exceeding the maximum set out above will not be counted.. Voting times may change. 4. Votes are only open to individuals as consumers from the UK, and not to any agencies, businesses and/or companies. 5. The BBC reserves the right to cancel or suspend voting at any time. In the event of any such cancellation or suspension, a technical failure or any other malfunction with the vote, the BBC reserves the right to arrange for the winner to be decided by a contingency arrangement from the votes cast by a pre-agreed contingency panel. This panel will be the same as one which devised the shortlist - see above for details. The BBC can only guarantee that votes individually entered directly through the telephone numbers promoted and those registered through the promoted online voting will count. 6. The vote is open to all residents of the UK, including the Channel Islands and the Isle of Man. Please note that BBC or BBC Group company employees, their close relatives or anyone directly connected in any way with the production of the programme or the provision of fixed line telephony services to the programme are not eligible to vote. 7. Each phone vote costs 10p plus your network's access charge. For up to date information it is always advisable to check with your service provider. 8. Telephone voters must obtain permission from the bill payer before voting and those under the age of 12 should obtain parent/guardian consent before voting. Make sure you carefully dial only the number of the person you wish to vote for. 9. If you are viewing the programme through BBC iPlayer or any other time-shifting or on demand service you should check carefully whether the vote is open before doing so as it may have closed. 10. Make sure you dial carefully only the number or type carefully the short code / keyword combination of the person you wish to vote for. 11. You can vote up to a maximum of 3 times on your telephone. The BBC reserves the right to disqualify votes if it has reasonable grounds to suspect that fraudulent voting has occurred or if it considers there has been any deliberate attempt to manipulate the result. The BBC can only guarantee that votes individually entered directly through the telephone numbers or short code / keywords promoted by the programme will count. 12. There are a number of contingencies which could occur. These may include the decision reverting to a back-up panel formed by people from the sports sector, in the event of problems with the phone or text vote or in the event of a tie. The BBC will decide on contingency plans as it deems necessary and appropriate to the circumstances Any such use of contingencies will be declared. 13. For purpose of verifying any claim for refunds (where offered for telephone votes) or investigating possible online voting irregularities the BBC may use telephone numbers, cookies, log IP addresses or analyse the information from your BBC account. The BBC will not publish this information or provide it to any third party without permission, except where required for enforcement of these terms. Please see the BBC's Privacy and Cookies Policy for more information at http://www.bbc.co.uk/usingthebbc/privacy/privacy-policy. For example, we may use your personal data for the purpose of running the vote (including processing refunds or investigating possible voting irregularities) and for the purpose of personalising our services where you have shown interest in a particular show, including voting online (http://www.bbc.co.uk/usingthebbc/account/how-is-the-bbc-personalised-to-me/). 14. The BBC, its sub-contractors, subsidiaries and/or agencies cannot accept any responsibility whatsoever for: (i) any technical failure or malfunction or any other problem with any telephone network or line, system, server, provider or otherwise which may result in any vote being lost or not properly registered or recorded; and (ii) any of the nominee withdrawing from the event or refusing to accept the award for any reason. 15. The voting is verified by an independent verification service. 16. The voting in this programme accords with the BBC's Code of Conduct for Competitions and Voting, details of which can be found on the BBC's Standards and Guidelines website. 17. These Terms and Conditions are governed by the laws of England and Wales. This award honours someone who has made a major impact on the world of sport in Wales during their lifetime. It is decided by the panel of judges as described above. The award will be presented live on the Wales Sport Awards programme on Monday 4 December 2017. This award honours the coach or manager whom it is felt has made the biggest impact in Welsh sport during 2017. It is solely decided by the panel of judges as described above. There is no public vote. The award will be presented live on the Wales Sport Awards programme on Monday 4 December 2017. This award honours the team which is felt to have made the biggest impact in Welsh sport during 2017. It is solely decided by the panel of judges as described above. There is no public vote. The award will be presented live on the Wales Sport Awards programme on Monday 4 December 2017.